I have been working on getting a Kerlink IoT Station to work with GPRS/3G as its primary uplink path. A client asked me to do this configuration because they did not have the resources to it themselves. No problem. I have been working with LoRa and Kerlinks for a while now doing a consultancy job for another client (a big telco). They did not want to connect the Kerlink to their local network for security reasons. They wanted to add their gateway to TheThingsNetwork.org (TTN), a global open crowdsourced Internet of Things data network that started in The Netherlands. Reading the forums, I noticed that many trying to do the same have run into issues. The documentation is sometimes incomplete and scattered so it takes a bit of effort to get it to work. 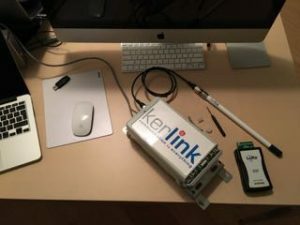 Configure a Kerlink IoT station to use its GPRS/3G modem as its uplink path and connect it to TheThingsNetwork.org. The SIM provided was a PukData M2M SIM which uses the KPN mobile network in The Netherlands. Normally, the Kerlink will use its ethernet (eth0) uplink as its default path. The basic idea here is that, if configured correctly, an autoconnect mechanism will trigger the GPRS bearer, establishes a PPP connection and set a default route and DNS. Set the GPRS options to match your SIM and telco’s APN settings (i.e. APN name, pincode, username and password). Configure auto connect in the knet monitor. Because no username/password is set for this APN, and empty username/password fields trigger a bug, I also installed the patched GPRS init script. If your SIM comes with a pin code (usually 0000), set it with ‘GPRSPIN=<your pin here>’. If your APN username and password are to be left empty, replace the GPRS init script with the patched version as mentioned at the bottom of the guide. Carefully choose your ip_link address in /knet/knetd.xml depending on your requirements. This address is pinged periodically to determine if the GPRS auto connect needs to be activated. In my case I wanted one that is only reachable over the GPRS APN (e.g. for KPN use their DNS server: 194.151.228.34) to force it to bring up the ppp0 interface whenever possible. If you’re using GPRS as a backup path this should be different (I guess an address only reachable via eth0 but make sure the PPP session is terminated as soon as the primary path becomes available again). Use tcpdump (e.g. tcpdump -i ppp0 -n -v port 1700 or icmp) to check if it is pinging the correct address and if status updates are sent. I chose not to use peerdns (GPRSDNS=no) because the default DNS servers are not restored in case of a GPRS connection failure, thus breaking eth0 as a fallback path. I used the Google public DNS servers in stead as they work on both paths. This could also be fixed in /etc/ppp/ip-down. The (poly) packet forwarder needs to be restarted whenever there is an interface change to make sure it binds to the right source address. If it isn’t you will see packets going out the ppp0 interface with the eth0 source address (or vice versa). I added ‘/usr/bin/killall poly_pkt_fwd’ to /etc/ppp/ip-up and /etc/ppp/ip-down. The firewall is not enabled by default. Make sure to edit /etc/init.d/firewall to your needs and turn it on in /etc/sysconfig/network (FIREWALL=yes). Don’t forget IPv6 although dropbear for instance does not listen on a v6 socket. Check if the gateway is still active (is sending status updates) and node messages are received in the TTN API after unplugging the ethernet uplink cable. If you’re using an ethernet power injector, make sure to unplug the cable going into the injector rather than the one going out to the Kerlink. Duh! 😉 Remember that you can’t log in to the gateway anymore, assuming access to the GPRS/3G address is blocked. Plug the ethernet cable back in and see if you can log in again. Then check if updates/messages are still being sent over the ppp0 interface using tcpdump. Power cycle the Kerlink while leaving the ethernet uplink cable unplugged. This will make sure the Kerlink will boot successfully in stand-alone mode, which was the whole purpose of this exercise. Don’t hesitate to leave a comment below or send a message. What Exactly Is The “Internet of Things”? An infographic. Postscapes and Harbor Research collaborated in creating this nice infographic of the “Internet of Things”. Or is it an “Infographic of Things”? Over the last several years, stories of the technologies making up an Internet of Things have started to slip into public consciousness. As this is occurring, we believe the whole story of Smart Systems and the Internet of Things is not being told. Many of the dispatches coming in from the “front lines” of technology innovation are but fragments of a much larger narrative. Postscapes collaborated with Harbor Research on an infographic to tell a more complete story about the Internet of Things. Many people are searching for configuration examples on how to set up an IPv6 enabled FTP server like vsftpd. Here you will find examples of a number of popular FTP servers. This article covers vstftpd for Linux. It was much needed. Especially now that Google ranks sites based on how well they do on mobile devices. Time for a major overhaul of our website. We’ve moved it from a way too old Joomla setup to state of the art WordPress site. Joomla appears to be dying slowly anyway. It’s much faster and completely responsive which means it will automatically adjust its layout to smaller mobile screens. Very cool. At the same time we have removed some of the less popular parts like the forums. They were being used by spammers mostly. 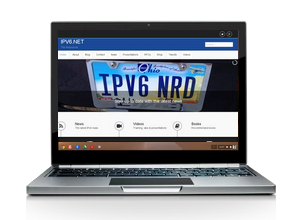 And we don’t like those.. We have improved the #ipv6 twitter stream and added a shop where you can find the coolest t-shirts and other IPv6 related things like mugs and stickers. There’s no place like ::1, right? We have partnered with Zazzle for this so get yourself one of those cool shirts today! We’ve also improved the book shop so you will be automatically directed to your local Amazon site for all your IPv6 purchases. We have also added a selection of IoT (Internet of Things) books since this subject is highly linked to IPv6.